We do not offer plants for sale but will gladly try to direct you to quality sellers. The goal of this site is to provide clear yet scientifically accurate information. This website is best viewed using Internet Explorer 8.0. Sorry, Firefox and Google Chrome stack text on this page. If you do not wish to hear the sounds please press stop to end. "Much of what we believe is based on what we have yet to be taught. Listen to Mother Nature. Her advice is best." 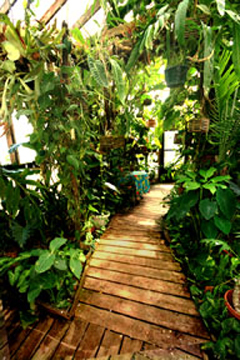 The Exotic Rainforest is a privately owned botanical garden in Northwest Arkansas. Colocasia, Monstera, Amorphophallus and other members of this family of nearly 3700 species in 119 genera. Visitors are welcome without charge, please call to make an appointment. Sorry, don't sell plants and we don't maintain regular hours. All photograph on this website are copyright protected, Copyright 2005, 2006, 2007, 2008, 2009, 2010, Steve Lucas unless otherwise noted. What is in the Exotic Rainforest? by scrolling down this page or in the Gold Box below. 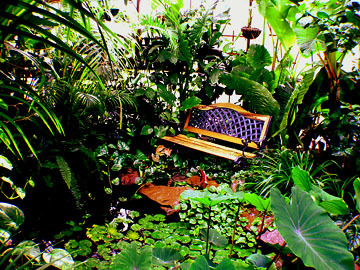 ....many rare Philodendron, Anthurium, and exotic rain forest species! tropical plant you cannot identify? The International Aroid Society is here to help! "We're here to help you find answers!" Trained scientists working with qualified growers to help you learn more! 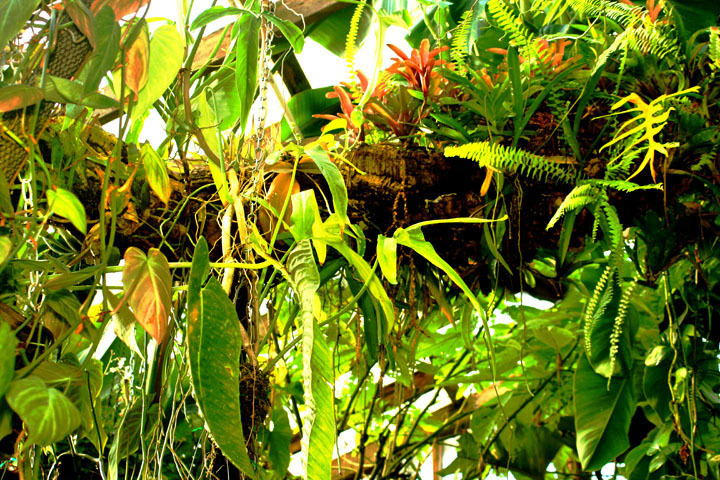 Want to Build your own Tropical Rain Forest? Follow the trail by clicking the photo just above. Be sure and continue down the "rain forest path"
by clicking the last photo on each page. This site is intended to be an informational source. Visitors are welcome in the garden. Contact information is near the bottom (left) of this page. Looking for information on a specific exotic plant species? This site contains hundreds of pages. common name or the scientific name start here: Plants in the Collection. What is a stem? What is a petiole? Is a stem the stalk that supports a leaf? Just add Ice cubes to a tropical orchid? Is that really a smart idea? Want to meet new friends that enjoy tropical plants? 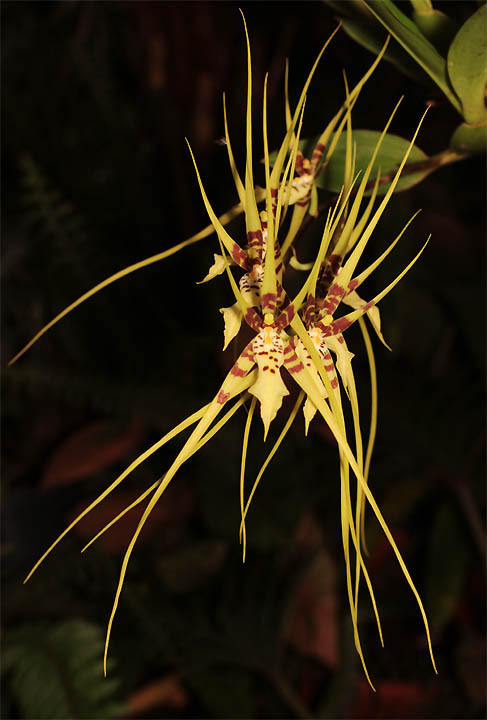 Many of the most popular collectable plant species in the rain forest are aroids! Aroids are among the most frequently grown house plants in the world! and modern botanists estimate the total number of species is closer to 6000. Calla Lily, Amorphophallus, Caladium and many other exquisitely spectacular genera. production of an inflorescence known as as a spathe and spadix distinguishes an aroid species. grow but make the information available to any plant enthusiast. Sorry Firefox and Google Chrome users! You may have to scroll WAY down the right column below! Firefox and Google Chrome apparently cannot read some of our coding! In 1974 we made our first trip to an Exotic Rainforest. That one was in Puerto Rico and from that moment I fell in love with the rare exotic plants that live in the rain forests of the world. In 1979 Janice and I took our three children and moved to the island of Jamaica where we lived and worked for almost two years. To this day we miss all the time we spent roaming around the island as well as its people, food, incredible beaches and rain forests. Following that I fell into a fortunate string of events while working as a photographer/writer for Skin Diver Magazine. SDM allowed me to visit the Indian Ocean, tropical Pacific, parts of Southeast Asia, the Red Sea and opened doors that eventually allowed me to create brochures and ads for hotels and island governments. For many years I was able to travel hundreds of times to islands such as St. Lucia, St. Vincent and the Grenadines, the U.S. Virgins Islands, and the Bahamas. I was fortunate to do work for, the Cancun Hotel Association, the Cayman Islands Tourist Association, hotels and properties in South America, Central America as well as other Caribbean governments and hotels. Needless to say, we have tropical "blood" flowing in our veins. The jungles and rain forests of South America, Central America, the Caribbean, S.E. Asia and the tropical Pacific are alive with a varied selection of unusual and often rare plants. Regrettably, far too many are being destroyed and my grandchildren may never see one. By doing nothing more than logging on to Google Earth you can see vast areas of Brazil that have been almost totally stripped of forest! Fortunately my work as a writer as well as a commercial and underwater photographer took me on journeys to many of these exotic destinations so, at least in my memory, they will live forever. In the years that followed our first rain forest visit I was privileged to make many flights to countries around the world that have living, thriving rain forests. Part of the goal of this site is to introduce you to their natural beauty as well as encourage you to visit, preserve and protect them for your children to see as well. Although I retired in 2001 I've photographed some of the jungles of tropical nations such as Venezuela, Mexico, Belize, Columbia, Honduras, Ecuador, and Malaysia. On my first visit to Singapore in 1986 I was escorted by a representative of the government on a visit to the national orchid collection which houses the world's largest collection of orchid species. 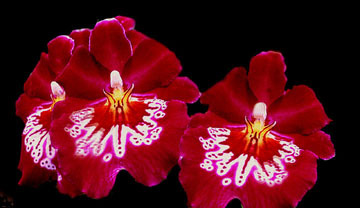 Instantly my interest in these beautiful flowering plants with "tribe" names such as Oncidium, Dendrobium and Cattleya was ignited. 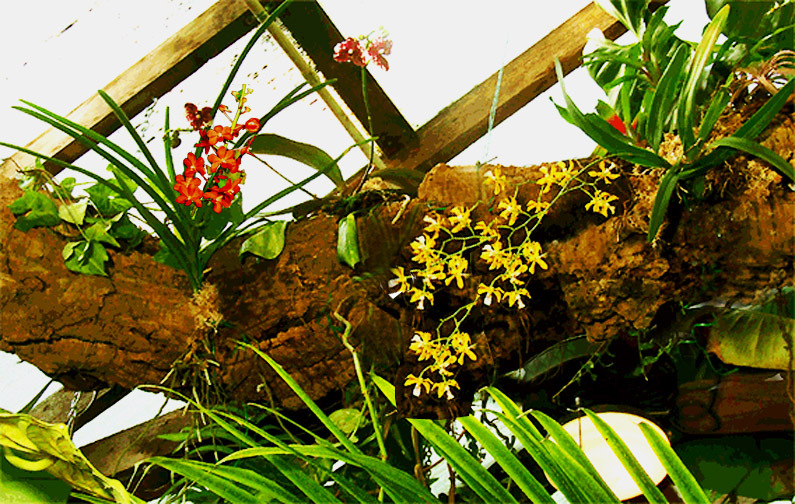 Now we have hundreds of orchids from Asia as well as South and Central America and the Caribbean living in our own Exotic Rainforest. 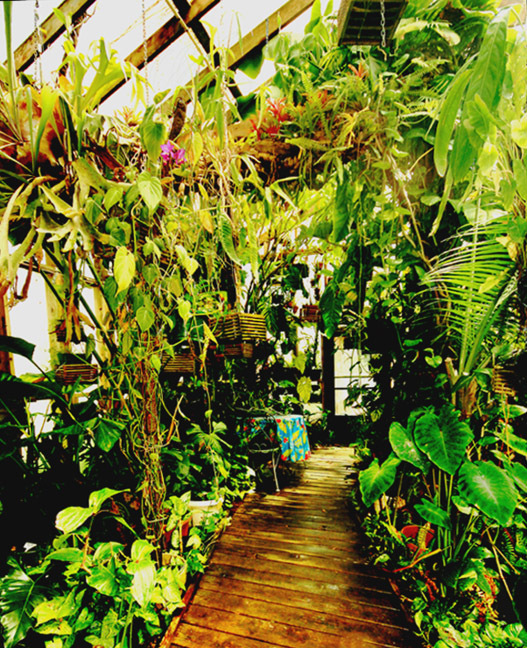 Living in Miami, Florida from 1980 to 2001 I had the perfect location to house my collection of plant species. Everything lived in my yard, and my entire ½ acre was landscaped with three tropical ponds with flowering water lilies and hundreds upon hundreds of exotic aroids and other rare plants. So just before 2000 when my wife Janice began to want to move closer to our grandchildren, adult children and her parents after 25 years in Florida I was determined to move the entire collection and make rare tropical plants accessible to folks who have never seen a rain forest. We now own the only living rain forest in Arkansas and likely in most of the central United States. We've hosted as many as 60 visitors on a single weekend and people are often amazed such exotic plant species live in our artificial rain forest behind our 119 year old home exactly the way they do in nature. I began to draw plans for the Exotic Rainforest years before we moved and told my friend Tom White who owns Zone Ten Nursery south of Miami I was going to build a "rain forest" in Arkansas in 1999. He thought I had lost my mind. I did have reservations about leaving Florida but my only restriction on the move was I would take all my plants! So now in the tiny rural community of Siloam Springs in Northwest Arkansas right on the border with Oklahoma and not far south of Missouri we own a flourishing rain forest! 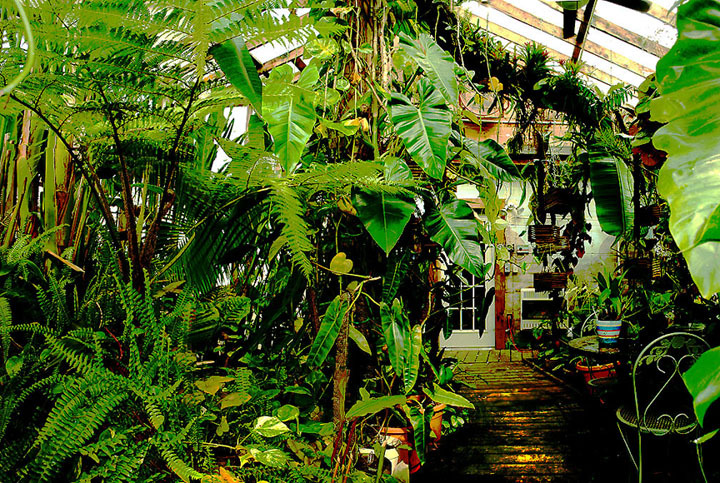 The Exotic Rainforest is not your typical "tropical plant collection and is not a nursery". We don't sell plants. 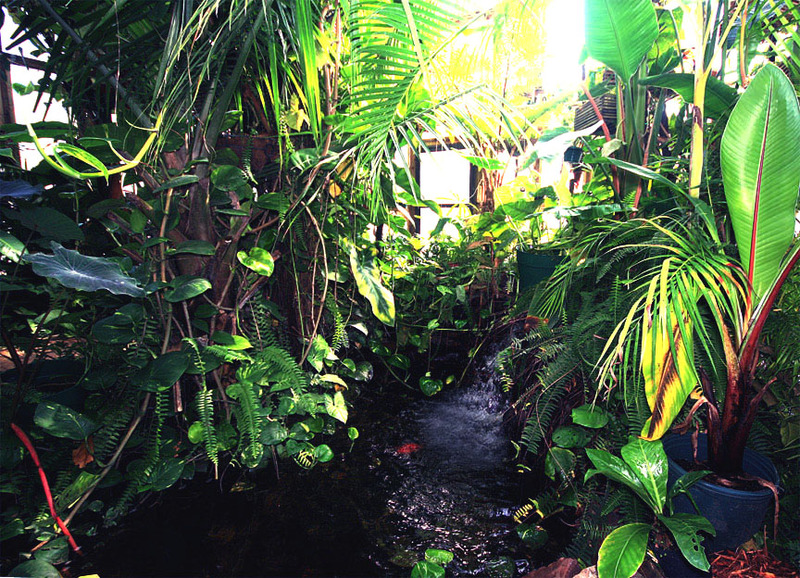 The Exotic Rainforest is more like a small botanical garden open to the public . One guest called it "Costa Rica under glass". Unlike most plant collections which live in pots our collection resides in an atrium designed to be as close as possible a true rain forest. Just like it rains in any rain forest our plants are watered almost daily via an automatic system. The entire building is designed to duplicate nature as closely as possible and hopefully it gives everyone that enters the feeling of visiting the tropics. Many of our specimens are planted in the ground which was specially prepared to be "tropical" Our rarest specimens are in large pots with soil prepared to suit each individual specimen. Learn how we built the Exotic Rainforest here. We love to share our plants and gladly answer questions. We welcome anyone who wishes to visit. We also make the Exotic Rainforest available to educators as a teaching tool and both public, private and home schoolers are welcome to visit the garden as a field trip but due to size we must limit group size to approximately 20 people at one time. Please call before you visit. As of mid 2009 there are many plant species as well as over 300 species of Araceae (uh-RAY-see ee) known as aroids in the collection. 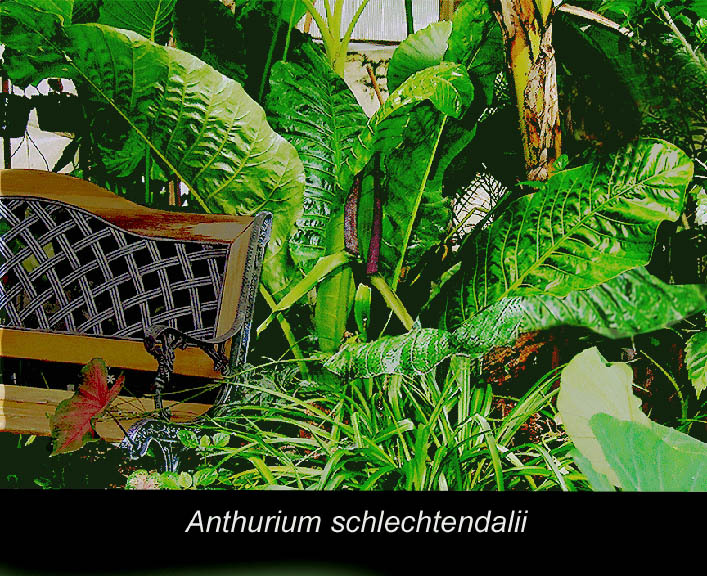 Our aroid collection includes a full 10% of all the nearly 2000 Anthurium and Philodendron species known to science. A number of those were acquired through associations with accredited botanical gardens and we have the exact locations including GPS coordinates where they originated in the rain forests of the world. Having acquired many rare plants we also share specimens not in the collections of some public gardens with those institutions. The collection even includes specimens which have never been identified to science. This site was created to give my adult children Brad, Stephanie and Kari as well as grand children Jeff, Emma, Justin, Sophie, Ellie, Jordan, Hayes and Nash insight as to "what is what" in the collection and where it originated in nature. I purposely designed the site to give them a "note book" along with my photos they can use to learn about my passion . I know I won't be here to care for the plants forever so I want the information to survive along with the specimens. Eventually every plant will end up in the collection of a public garden to be enjoyed by all their visitors and it is my hope the information on this site survives along with the plants. I attempt to verify all my facts botanically but I am not a botanist. I'm also certain I make errors so if you find one please drop me a note and I'll research it further. I sometimes get email telling me the name I used or some fact is in error. That's probable since I'm not botanically trained but I always attempt to verify information from a botanical source. Many of our pages are actually proofed by botanists. Hopefully you will find the information of value. The information on this site would have never been possible without the constant guidance, assistance and input from a large number of botanical scientists and plant experts. I must thank my mentor world renowned aroid botanist Dr. Thomas B. Croat Ph.D., P.A. Schulze Curator of Botany of the Missouri Botanical Garden in St. Louis who often allows us time in his office and answers an incessant stream of questions. 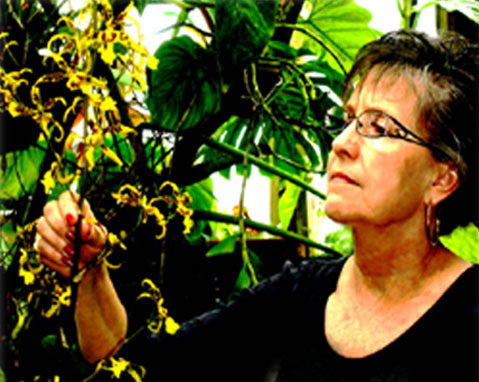 Dr. Croat has personally collected more than 100,000 specimens in the tropics. In addition my thanks to Dr, Simon Mayo of the Royal Botanic Garden Kew in London, Dr. David Scherberich of the Jardin Botanique de la Ville de Lyon, Parc de la Tete d'Or, France, Dr. Eduardo Gonçalveswho is the Curador Botânico of Inhotim in Brazil, Dr. Marcus A. Nadruz Coelho, Diretoria de Pesquisas, Instituto de Pesquisas Jardim Botanico do Rio de Janeiro (Rio de Janeiro Botanical Garden) in Brazil, Dr. Alistair Hay formerly of the Sydney Botanic Gardens, Sydney, Australia, aroid botanist Peter C. Boyce of Malaysia, Harry Luther at the Marie Selby Botanical Gardens in Sarasota, FL, 2008 International Aroid Society president Denis Rotolante along with his son "Big Bill", 2009 International Aroid Society president Ron Weeks, International Aroid Society founding member Tricia Frank, taxonomist Christopher Rogers, and many others. A special thanks to my close friends and aroid expert Julius Boos in West Palm Beach as well as aroid, palm and cycad expert Leland Miyano in Hawaii. Both are published authors and without Julius' and Leland's assistance many of the pages on this site would not have been created. All of these individuals freely answer my requests for scientifically accurate information as well as photographs. Some even donate their time to proof the information on the site. With their input and help the Exotic Rainforest website achieved its 1,500,000th hit in mid September, 2010 after just over fourf years on the internet, a goal we never conceived possible when the site went on-line on December 6, 2005. In addition to all the species shown on this site there are well over 100 plant species in the Exotic Rainforest collection not photographed and described. We attempt to add new specimen pages to the site frequently. With the assistance of all the botanists and experts mentioned above I always attempt to verify my facts before putting the pages on the internet. You will normally find the scientific sources credited on the appropriate page but should you find an error please do let us know. If you are visiting or live near Northwest Arkansas and love exotic plants as much as we do you are always welcome to visit. There is no charge to see the garden and Wizard the macaw will be glad to see you, and so will we! By the way, if any of you know Tom and Linda White or visit their Zone Ten Nursery and Garden in Miami will you please pass along this message? "Tom. I built the Exotic Rainforest exactly the way I told you I would. You wouldn't believe what can be done if you set your mind to it!" "As a national garden radio show host I have to research thousands of sites. By far the Exotic Rainforest has the most interesting information and the best photography I have ever seen. I have all ready told all of my friends about the Exotic Rainforest and will continue to let all of my listeners know about this site. Steve's dedication for accuracy is impressive, he is a master researcher and I consider it the best private site I have ever seen." You can listen to the Garden Rebel on the world wide web at www.wdbo.com live on Sunday mornings. You can also hear Vince's nationally syndicated show on any of the Radio America Network stations every Sunday morning from 10:00 - 12:00 Eastern time. Be sure to call in, he loves making new friends! Take the Rainforest Tour now? This website is intended to be a source of information! We do not sell plants or maintain any form of price list. All photographs on this website are the copyrighted property of Steve Lucas and The Exotic Rainforest unless otherwise noted. We strive to give appropriate credit to all botanical sources. We do not object to our research being quoted provided we are given appropriate credit including this website link. In some cases we will make photos available without charge upon request for non-commercial use. Most photographs are shot in high resolution digital format and are suitable for magazine reproduction. Didn't find what you need? 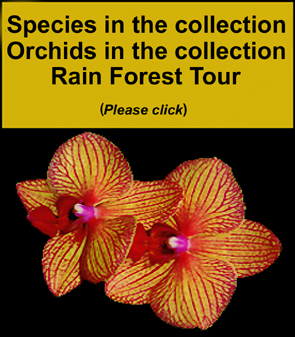 Links to rare tropical collectors, botanical gardens, ecotours, and plant sources. the ZZ or Zee Zee Plant has more false information on the internet that anyone should believe. It will go dormant if not watered! This plant is a hybrid and not a species. Epiphyllum phyllanthus subspecies phyllanthus (L.) Haw. Why you may find it difficult it identify a plant. Natural variation and morphogenesis within species. Leaves do not have to be alike. So what is it and how should you water the plant? Read how we found out. A Cobalt Blue Fern from Thailand! Looking for an "Elephant Ear" Plant?? Trying to Buy Anthurium seeds? Need Help with a Tropical Plant? The Curse of the Common Name! Will Green Light Kill Your Plants?